After our winter pause the Tropical Diaspora Party is proud to announce the come back to the “all night long groove tropical party”. We begin the season this year with a great after party for the street parade Karneval der Kulturen 2018. 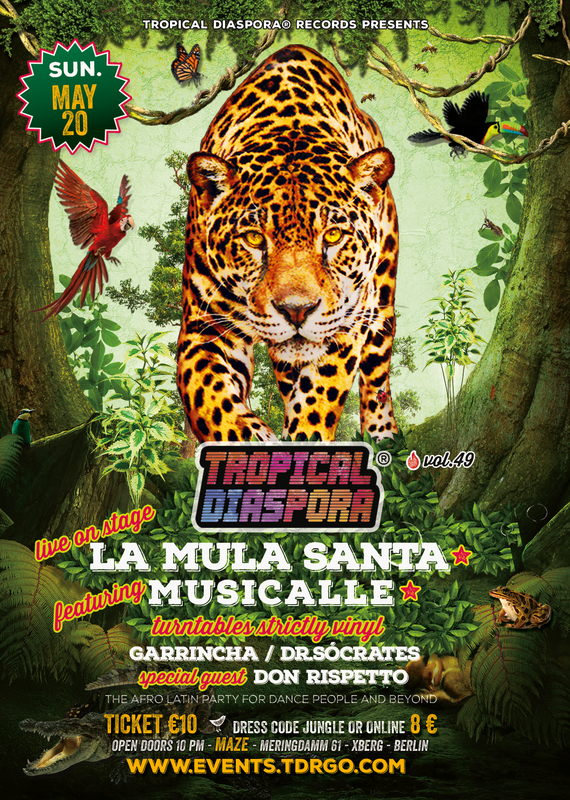 We are waiting for everybody that have enough energy and illuminated vibes to dance with the best Afro Latin Diaspora music live on the stage. Furthermore, you will come together with the artists from the street parade groups that will be there with us and enjoy the party in one of the best venues in Berlin – Kreuzberg, the MAZE an amazing basement in the original taste of the Berliner 90ties. ★ WHEN: 22:00 OPEN DOORS 23:30 LIVE and Open End. Dj GARrinchA along with Dr.Sócrates, describes their party musical ethos as “The platform for live music and performance dedicated to the fusion of different styles, a culture way that is especially cultivated in Brazil since the days of Tropicalia.” They are right: The melting pot of samba, cumbia, dancehall, afro beat, funk, Brazilian and latin sounds, Soul and everything connected to the afro diaspora matter in the music results in a bump ‘n’ grind groove that the people in the dance floor can’t get enough of. Fresh from gigs in Brazil, USA and Europe, they are kicking off a series of parties in Berlin, featuring many Bands and DJ´s from Europe and worldwide. As a Radiomoderator he started 1993 at Kiss FM. In the end of the 90ties, he switched to radiomultikulti, where he moderated a special Saturday radio show “Radio Kanaka International”. This show was primarily intended as a forum for new talents, but also for established artists, to give them the opportunity to present themselves in their own way (“Radio for da people”). The whole spectrum of multicultural off-in culture gathered at his studio. The news from the international music and art scene were then brought with the “Berlingo” among the people. And as a Master of Ceremony it was and still is my job to design programs, organize events and jams of course, to bring it all over with a relaxed flavor.